Integrity Tests Should Apply To Information, Too. On July 14th, on an MSNBC Countdown segment about the pending well bore pressure tests of the Macondo well, an oil industry MBA named Bob Cavnar was "confused," saying this was the first he'd heard of an "integrity test," then suggesting that something was "not making any sense," as if some other agenda might be in play. He went on to imply that the entire operation might be some new ruse to somehow help BP to mitigate their liability by distorting that data which might come from the well conditions. This segment disturbed me greatly, and sure enough, already this morning, I am seeing people tweet about it, implying there *must* be some nefarious doings afoot. I have no love of BP, nor any wish to defend them, but that doesn't mean I want to see such suggestions made without hard information, and especially not when it's said in concert with something said that was just blatantly inaccurate. I don't know where Cavnar had been vacationing without Internet access, but there was nothing surprising, unusual, nor unmentioned about either the test or the entire operation, which had been in progress for many weeks. Also, while now called a stacking cap, or "sealing cap" or "hard cap," these novel terms are simply new and more public relations-friendly descriptions for a second blowout preventer of a marginally different design. BOPs have a bad name of late, and "caps" seem more understandable to lay people. BOPs of any type are always pressure tested after being landed on a wellhead. Because cases like this are instructive, and as our media choices get smaller and smaller, I think we all need to be vigilant about what we see and hear. The Gulf oil crisis is generating a lot of bad information, and often a lot of outright hysteria is being spun from it. It's vital that we all try to address the inaccuracies and fallacies when and where they appear. I have great respect for Keith Olbermann and his MSNBC producers. There is no way they can possibly vet or fact check everything said by their guests in real-time, and it isn't reasonable to suggest that they should. This was just one of many similar examples of such misinformation incidents I've seen over the course of this and other crises, and I think all media and their viewers should be more sensitive toward them. Whether it's Fran Townsend distorting national security facts, or some Heritage flack distorting economic data for partisan advantage, these self-proclaimed experts can be consistently wrong, or needlessly hyperbolic, often without offering a shred of evidence to support their assertions or analysis. In many cases, this never seems to prevent their being invited back again to offer up more of the same. It all serves to illustrate for me that our Sunday talk shows are not the only things that could benefit from real-time fact checking. Television hosts and producers cannot be expected to know everything about an issue, which is why they use "experts" in the first place. I think it is incumbent on we, "the crowd," (as NYU journalism professor Jay Rosen would call us), to keep them as accurate, candid, and honest as we can. Too much is riding on good information to let the bad information gush out without notice or comment. "Tadeusz Patzek, a professor who is the chairman of the department of petroleum and geosystems engineering at the University of Texas, argues that the well bore integrity discussion has been hijacked by people who don't know what they're talking about." "There is a lot of fast talk, which has little relation sometimes to reality," Patzek said. "And there is jumping to conclusions by the people who have no right to jump to any conclusions because they don't know." Everyone would profit from reading Prof. Patzek's testimony to Congress. It articulates a whole host of issues we must deal with as we go forward with the very risky business of deep sea oil exploration. It can be done safely, but it requires a lot of people with pretty poor science and technical backgrounds to bone up on a lot of things. "More study of offshore drilling needed to prevent tragedy"
Posted in Accountability, Gulf Oil Spill, Media. The endgame is tricky. 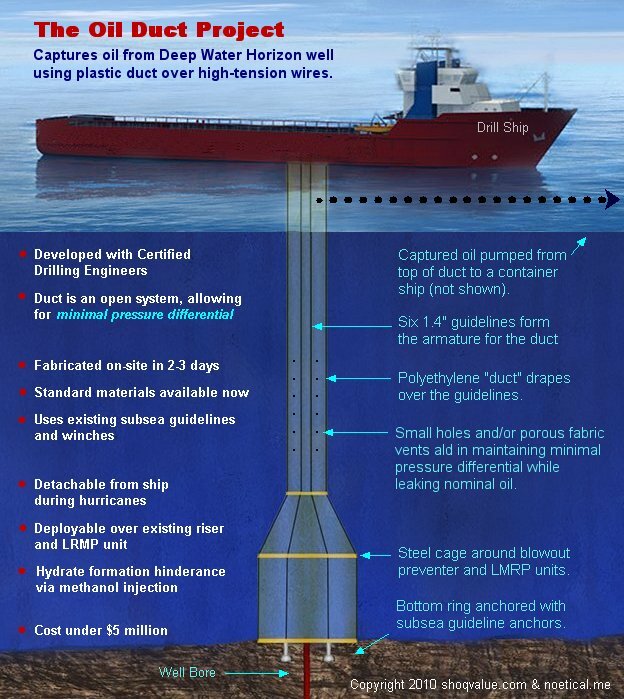 No one knows the condition of the well bore deep below the gulf. It's conceivable that the bottom of the well has eroded around the steel casing, said Charles West, a geophysicist who has consulted for the petroleum industry and worked on relief wells. If that's the situation, he said, drilling into the casing would be "like trying to chase a strand of spaghetti around with a spoon." That would force the drillers to back up and aim a bit higher on the well. Finding the target is critical. The drill bit can't turn on a dime; if it misses, it will have to be backed up for another approach. Posted in Gulf Oil Spill.